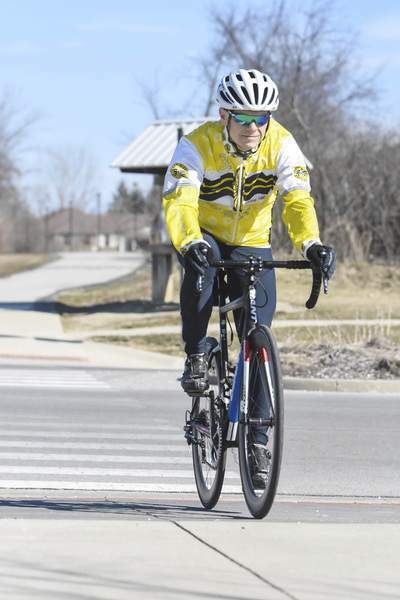 Michelle Davies | The Journal Gazette Patrick Stelte of Fort Wayne, going for a bike ride at the Dupont YMCA, says he began “seriously” riding in the spring of 1987. After a six-year hiatus, the Road Sage column has returned on a monthly basis. In this space, Dave Gong, The Journal Gazette's local government reporter, will provide updates on public works projects in the Fort Wayne area and answer questions from readers. Submit a question by emailing roadsage@jg.net or tweeting @JGRoadSage. Your question could be selected for next month's column. This month, it's all about the bicycles. With the start of spring, more of Fort Wayne's bicyclists will once again be pedaling the city's streets. That means drivers will have to share the road. I'm not a cyclist. I think I've ridden my bicycle once in the past two years. But I don't want to see another ghost bike memorial at the site of a cycling death in Fort Wayne this year. So I asked Director of Public Works Shan Gunawardena, the Fort Wayne Police Department, Bicycle Friendly Fort Wayne and the Three Rivers Velo Sport Club Inc. for some safety reminders for those who ride frequently and those who don't. According to Gunawardena, determining who gets right of way – cars or bicycles – on a street with a bike lane can be confusing. It can be particularly tricky for drivers trying to turn right across a bike lane. If the cyclist is making a right turn and hasn't gotten to the intersection yet, they can make the turn behind the motorist, Gunawardena added. Bike lanes are also meant for people with a certain level of experience, Gunawardena said. Younger children and people uncomfortable with the bike lanes should stick to the sidewalk, he said, noting the city encourages riders of all ability levels. To help riders become more comfortable in the downtown area, Gunawardena said the city is developing planned bike rides every Friday from May through October. Those events should help riders become more familiar with riding around downtown and the surrounding neighborhoods. In an email, FWPD spokesman Michael Joyner highlighted hand signals as an important safety component for both riders and motorists. Cyclists should also wear reflective clothing and protective gear, ride with the flow of traffic and carry a cellphone and first-aid kit, Joyner said. Riders should also obey all traffic laws and be wary of the possibility of a motorist opening their car door into the bike lane. For motorists, Joyner had one message: give cyclists a wide berth. Drivers also need to constantly be aware of bicycles on the road, Kelsey said. On top of that, she recommends anyone who parks their car on a street with a bike lane use something called a Dutch Reach to open the door when exiting the vehicle. A Dutch Reach involves using the hand farther from the door to open it. The technique forces a driver to turn their body and look behind the car, minimizing the chance of slamming the door in the path of a passing cyclist. Patrick Stelte, president of the Three Rivers Velo Sport Club Inc., said distracted driving still remains a major concern for cyclists, especially on streets without a dedicated bike lane. For emphasis, Stelte recalled a recent incident that happened while he was riding on Winchester Road. There are 10.2 total miles of bike lanes throughout Fort Wayne, Public Works spokesman Frank Suarez said. The lanes exist on Main, Wayne and Berry streets, as well as Rudisill Boulevard, Stellhorn Road, Hobson Road, Fairfield Avenue, Ewing Street, Brackenridge Street and on the Anthony Boulevard bridge. The first lanes were installed in 2009. Other bicycle-related infrastructure includes bike boxes, which give cyclists a safe and visible place to stop at red lights; sharrows, which are painted on routes without enough room for a dedicated bike lane; and the Fort Wayne Rivergreenway. Suarez said there are 8.5 miles of sharrows or signed bike routes in Fort Wayne. Fort Wayne also has more than 100 miles of trails cyclists can use. More information about bicycling in Fort Wayne can be found at http://www.fwcommunitydevelopment.org/bike-fort-wayne.